Good morning, and happy end to your week, my bookish friends! Before I say anything else about the book that's in the spotlight today, let's all take a minute to sigh in contentment over the gorgeous cover. Okay? Get ready. I don't know about you, but I'm a sucker for a lovely cover. This one absolutely fits that category. Better yet, Grimm's fairy tales make a debut here! I'm so excited to read this! I'll stop gushing though, and give you some more goodies. 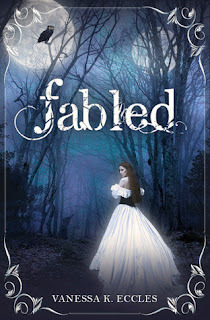 Enjoy, and don't forget to add Fabled to your reading list! The dirt shifted beside me, and the end of the tunnel opened. The crevice felt like it plucked me up in a whirlwind. In seconds, I landed on the ground face first on the surface of whatever lay beyond the tunnel. It smelled like nature after a storm. When I opened my eyes, I stared down at my mud-covered hands. The darkness that I once thought would be my tomb was now gone, and two low hanging moons lit the forest where I found myself. Even though I had no idea where I was, the fact that I was out of the hole sent a surge of relief that filled my entire being. I stood up, dusted off all the mud I could, and looked back. Strangely, there was nothing but trees. As I moved closer to the spot where I’d most certainly came from, all I saw was a mirror that reflected the woods. An illusion. I touched its smooth surface, tried to find the end of it but couldn’t. Another dead-end. Before I could figure out what to do, I heard a voice and spun around to confront it. “What are you doing here?” I heard a man’s voice growl, but I couldn’t see anyone. I looked around. He sounded like he was only a few feet from me. Right square in front of me, he appeared out of thin air. I blinked my eyes in disbelief. He seemed to be about my age and wore his hat cocked to one side with suspenders atop a blue button-up and brown trousers. It reminded me of Dashielle’s costume. I guess he could read the amazement on my face, so he answered the question that my mind was trying to form. 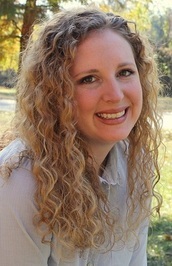 Vanessa K. Eccles graduated Troy University with a degree in English. She currently serves as executive editor of Belle Rêve Literary Journal and is founder of the book blog YA-NASisterhood. When she’s not writing or devouring books, she enjoys the lake life with her Prince Charming and their four dogs. On reading books at the "right time".